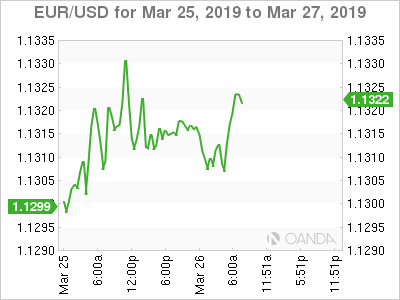 EUR/USD continues to drift this week. Currently, the pair is trading at 1.1325, up 0.11% on the day. On the release front, German GfK Consumer Climate fell to 10.4, shy of the estimate of 10.8 points. In the U.S., building permits is projected to dip to 1.32 million. CB consumer confidence is expected to improve to 132.1 points. German consumer confidence disappointed in March. The indicator slipped to 10.4, after two successive readings of 10.8 points. With the eurozone mired in an economic slowdown and German numbers pointing to weaker growth, it’s not surprising that the German consumer is less optimistic. This release comes on the heels of German business confidence, which improved slightly in March, with a reading of 99.6 points. The markets have been accustomed to releases above the 100-level, and the February reading of 98.5 was the weakest since November 2014. The survey noted that any improvement was confined to domestic sectors, such as construction and retail services. The manufacturing sector remains weak, battered down by the ongoing global trade war, which has dampened the appetite for German exports, such as vehicles and auto parts. Germany’s economy slowed down in the fourth quarter, and this bodes poorly for the rest of the eurozone. Is a recession in the cards for the U.S. economy? At last week’s policy meeting, the Federal Reserve indicated it had no plans to raise interest rates in 2019 and also lowered its growth forecast for 2019 to 2.1%, down from 2.3% in December. There was more bad news on Friday, as the spread between 3-month and 10-year Treasury notes turned negative for the first time since 2007. This is known as an inverted yield curve, which is considered a recession indicator. All eyes will be on U.S Final GDP, which will be released on Thursday. If GDP is weaker than expected, investors could lose their risk apetite and the Canadian dollar could lose ground.